It has been a long day. You’ve spent hours on the phone speaking to a new journalist, explaining what your organization does and its place in the industry, edited a byline for publication in your biggest trade journal, sat in on your CMO’s interview with the Big Local Paper, and circulated the review of your company’s new product to all of the senior executives. You’re just about to leave for the day, happy with your success, when your CEO knocks on the door. Great work, he says, but what does it all mean? Can you quantify it for me? For those looking to get beyond the clip book, here are five must-have metrics that will get your measurement programs started, whether you’re benchmarking your program or evaluating a single campaign. But beware: they might just get your CEO asking for more. Media Share of Voice. This metric allows you to benchmark your media relations programs against those of your key competitors and understand how awareness of your brand stacks up. A bedrock of competitive media performance, it is purely quantitative and is determined by the raw number of article mentions for a competitive set of companies. Volume Trend. This measures the frequency of your company’s mentions in the media over time, enabling you to identify whether specific campaigns or announcements had an impact on your organization’s awareness. Also a quantitative measure, it is calculated by measuring the number of mentions on each day over a specified time period (e.g. a month or a quarter). Issue Volume Analysis. This metric demonstrates which subjects, issues, products, brands or technologies are driving industry debate and provide a key measure of performance. It can help you test current messaging and positioning strategies, and help determine which trends may influence the market in the future. Favorability or Sentiment Analysis. This qualitative metric evaluates the frequency of positive, negative and neutral mentions in the media. It can help you assess the level of interest in your brand or campaign and the believability of messaging points. Leading Journalists. This metric ranks the journalists or bloggers who are writing the most frequently about your brand or topic. With it, you can identify both new contacts and focus on those who give you the most press. Diane Thieke is Marketing Director at Dow Jones. Smart Mobile PR? … There’s an app for that! These days, mobile should figure into virtually all of your communications programs. Channels used to reach out have become fractionated just as Web 2.0 tactics started to make sense. So, now it’s the mobile channel’s turn. The whole framework of the Web is based around the idea that everything is in a compatible format. Now with iPhone, Android-based devices, Kindles, iPads, Xooms and TVs connecting to the Web, that’s no longer true. According to data from Morgan Stanley, global shipments of desktop PCs will have remained virtually flat from 2005 through 2013. And, while notebook PCs will trend up over this same period, smartphones will have overpowered both categories in terms of worldwide shipments by 2013. In fact, it is estimated that next year, global shipments of smartphones will outstrip notebook PCs for the first time. And in countries with savvy technology users, such as Japan, mobile page views are dramatically eclipsing desktop page views. This is essentially an Internet land grab by mobile devices, especially Apple products like iPhones, iTouchs and iPads, which are ramping up aggressively. Whenever there are major share shifts in technology, there are always big winners — and big losers. Indeed, this should prompt PR professionals to look inward and question whether they are leading or lagging. Are PR pros asleep at the switch? We know the PR industry is still grappling with the shift from traditional media to social media. Making matters more complicated, in comes a whiplash swing to mobile. And unlike their marketing brethren, public relations practitioners have yet to fully exploit mobile’s opportunities. But why is this so if mobile is how people are increasingly consuming media? Sometimes PR is about how to influence stakeholders without the use of media. Still, according to the findings of a PR Week / CC Group survey, respondent data shows that using mobile to reach these influencers can be a complicated business. And significantly, 61% of the 28 tech and business media journalists surveyed said that they prefer desktop tools to mobile ones when it comes to reviewing PR material. But this may be changing, as there is a growing body of research to support that journalists leverage the blogosphere and social media sites for research and story ideas. Almost as important as the message itself is the channel that is being used to push it out. The message is important, but if it doesn’t get out via a medium that will reach your end user and in a format that will be relevant, then the message really doesn’t matter, now does it? If money follows eyeballs in marketing, then influence follows mobile in PR. Brian Panton is a report writer and quality assurance specialist based in Washington, D.C. This week, a couple of us got to talking about the recent New York and London Fashion Weeks. And we wondered: who got the most buzz? We did a bit of research and number crunching and the results were really interesting! We decided to put together this little Prezi and share what we found. Hope you enjoy it. Let us know what you think. Check it out in full screen for best viewing, then click autoplay. Diane Thieke, @thiekeds, is Marketing Director at Dow Jones, based in Princeton, NJ. Data crunching provided by Damien DuPont, report writer based in New York. Follow us at @dowjonesinsight. One of my Twitter followers recently asked me about the pros and cons of allowing employees to act as brand ambassadors in social media channels such as Twitter. Some of her executives were a little uncertain and wanted to know more about how to manage it properly. A long time ago, I had the same concerns. I headed PR and was not crazy about expanding my limited list of spokespeople to everyone in the company. I think that’s a familiar feeling for PR pros and executives alike. But, I had a change of heart. So many of our employees were proud of the products they were building and selling. It was hard to see why we should prevent them from sharing their enthusiasm. Sure they were critical too, but that criticism had a purpose: to make the products better. Ultimately, I decided that their enthusiasm would be infectious. Today, I don’t think there’s much question about whether there’s a benefit to having employees engaged as brand ambassadors in social media. Rather, the question, as posed by my follower, is more about how to manage it properly. What if the employee brand ambassador’s personality becomes bigger than the organization? I don’t have stats on this, so I’m going to go with a gut feel and one anecdote. I don’t think this is a probable scenario for most companies. The only example I can think of is Robert Scoble and Microsoft. While Robert became a brand on his own, I’m pretty comfortable saying that he didn’t really become bigger than Microsoft. He’s widely credited with giving Microsoft a human face during one of its toughest reputation periods. I think that turned out well for Microsoft. What guidelines should we give employees? Should we restrict them to tweeting about professional stuff only? Should we allow them to share personal stuff too? Social media is about people first. One reason that people don’t connect with brands is that they are perceived as impersonal. Big faceless corporations are harder to relate to or get emotional about. But all organizations are run by people. Many of them are interesting both in the office and out. I find it much easier to connect with someone who shares my interest in Neil Young’s music and who is passionate about the latest trends in social media. If they have personality, I will follow them. So, yes, let them share both personal and professional stuff. Have a social media engagement policy and be sure that your code of conduct policy is incorporated. Keep PR and internal communications tightly aligned. Communicating internally early (before external messages are delivered) and often is critical. Make it a regular habit to promote your brand internally, building enthusiasm and pride among employees. Reinforce brand attributes, values and personality through employee events, posters, etc. My follower asked if I could share articles I’d read and liked about employees as brand ambassadors. Here’s a few that I’ve come across over the last year or so. Diane Thieke is marketing director for Dow Jones, based in Princeton, NJ. Just a couple of weeks ago, Dow Jones published an analysis of PR agencies. Using Dow Jones Insight, our media analysis service, we looked at the media coverage of PR agencies and identified those who were covered the most. The story generated a lot of interest, and several readers pointed out that PR firms typically are too busy promoting clients rather than themselves. That led PRNewswer to survey its readers, asking whether appearing on the list was a good thing or not. The results are in, and nearly two-thirds said it was. We plan to take a look at social media coverage of PR firms in June, so stay tuned. Diane Thieke is Marketing Director at Dow Jones, based in Princeton, NJ. PR Week recently reported that the job market for PR professionals was rebounding, particularly for senior level positions. This is good news for the profession and job seekers. Looking into the future, what type of skills will senior PR professionals need to succeed in today’s complex communications and business environment? Martin Murtland, VP and Managing Director, Dow Jones, shared his view with Bulldog Reporter late last month. He sees two skills as being critical: alignment with the business strategy and strong analytical skills. Those with these skills will be “winners” who will drive new metrics designed to measure brand and issues in a much more complicated media landscape. The article is based on a joint presentation Martin did with Cindy Droog, APR, Senior Public Relations Specialist, at Amway. Their session at PRSA’s International Conference in Washington, DC, looked at new ways to measure brand and reputation, including velocity and advocacy. Read the Bulldog article and look at both Martin’s and Cindy’s presentations below, and share with us the new metrics you’re discovering. A negative event happens and the negative sentiment is attached almost exclusively to the most well-known brand involved, and not to the other brands who often should share the blame. Not too long ago we can remember the case of Dell catching all the negative press when the Sony batteries in its laptops overheated and caught fire. And does anyone know the name of Toyota’s brake supplier? 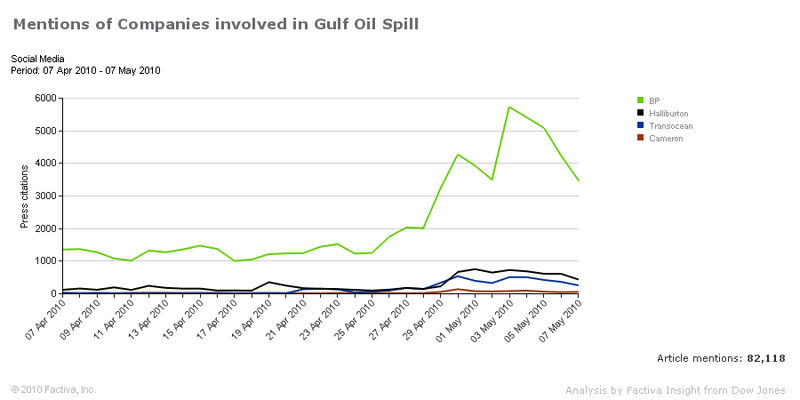 This month, the obvious example is the oil disaster in the Gulf of Mexico. BP is the name nearly exclusively associated with the event in the public’s consciousness. But BP Plc didn’t even own the rig which exploded on April 20; it had been leasing it from Switzerland’s Transocean Ltd. However, the still evolving story seems to indicate BP does not deserve all the blame. And it fact while it is accepting responsibility for clean up, it is pointing fingers at Transocean, one of three other companies involved to some degree in the event. Those other companies have been much less mentioned in the press and social media. Houston-based oil and gas equipment and services company Halliburton was the company who was engaged in the now notorious well-cementing operations around the time of the explosion. And Houston’s well-servicer Cameron International made the blowout preventer device, which failed to engage completely. Had that failsafe worked as designed, this story would be gone from the front page by now. An analysis of these four companies on Twitter, on blogs and boards and in the mainstream press shows a consistent picture. Household name BP has gotten the lion’s share of the press, arguably more than the others combined. In Twitter comments, Cameron is virtually absent, perhaps enjoying its anonymity outside the oil industry. Only the testimony that Halliburton and TrasnOcean have had to give to Congress this week has gotten them into the consciousness of the Twittersphere. In the mainstream press, BP still tops the others. Halliburton, well-known for its activity in the other “Gulf” as a contractor for the U.S. governement, has gotten less than 10% of the mentions of BP, running about 5000 per day for BP to 400 per day for Halliburton of the approximately 20,000 sources analyzed using Dow Jones Insight. Transocean, is continually more than Halliburton in the press, on several days last week about four times as much. 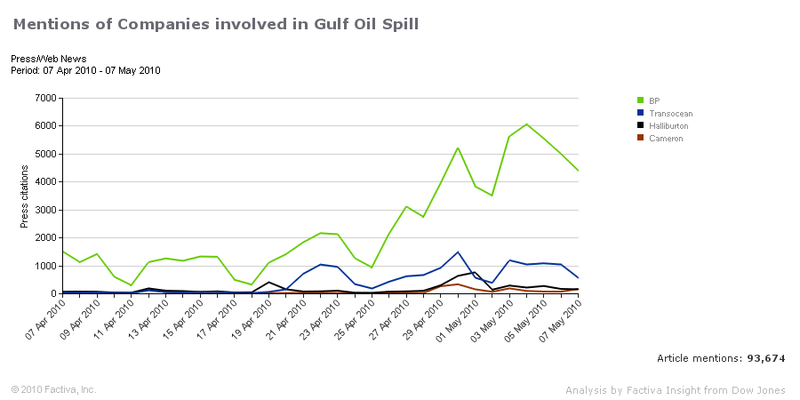 Mentions of BP, Halliburton, Transocean and Cameron in the mainstream media, before and after the event. Source: Dow Jones Insight. But in Social Media the name Halliburton probably has struck that familiar bad-guy chord and bloggers are talking about it nearly twice as much as Transocean. 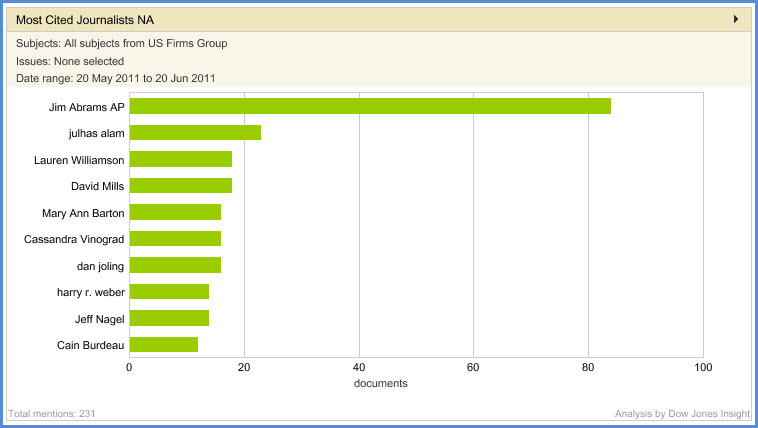 Mentions of BP, Halliburton, Transocean and Cameron in social media before and after event. The others companies seem a bit more camera shy. Halliburton hasn’t said much more than it did its job properly and completed it hours before the explosion. I can’t find a Twitter feed for the other companies. Though I found one called TransoceanRumor, which clearly means Transocean isn’t driving the social media conversation, they are being driven. Glenn Fannick is the director of product development for Dow Jones Insight, a media measurement tool. He is based in Princeton, N.J.
There’s a saying that things happen in three’s, and I recently found that to be the case when it came to a particular piece of communication advice. The message: make sure you provide a reliable space for folks to easily access clear and direct communication. The first incident was when I attended a PRSA event in New York City in March where Chris Barger, director of social media at General Motors, was providing his keynote address. In sharing his list of lessons learned during the company’s Chapter 11 bankruptcy filing, he stressed how setting up a company website that provided relevant information allowed company representatives to minimize conflicting messages and to easily refer the site to consumers when reaching out through e-mails, blogs, boards, Twitter and the like. I then ran across an audio interview last week with Dennis Urbaniak, a Vice President at Sanofi-Aventis, who stated that one of the most important things a company could do was establish a place for people to dialogue and receive credible information. This would allow the communications team to set up a regular channel with its consumers and avoid being caught up in a reactive-only cycle to consumer questions and comments coming in 24/7. My third ‘aha’ moment came via a BBC story reporting research findings on the reliability of medical advice on the internet. Of 500 sites searched, only 39% of sites provided correct information, with governmental sites providing the most reliable advice (100% accurate). Contrary to my expectations, the study found that company sites provided correct and relevant advice only 81% of the time, while news sites were on target only a paltry 55% of the time (researchers suggested that news sites had a potential conflict of interest with the maintenance of controversy, as opposed to outright providing incorrect information). While it may seem like a basic 101 lesson in communications, I was surprised to find this a lesson many companies are still learning the hard way. Then again, maybe it shouldn’t be a surprise given the pressure communications teams have to get on the bandwagon with social media. The priority to maintain a strong foundation could easily be forgotten as teams scramble to ready the company with new tools. In order to successfully communicate to your audience, you need to establish a reliable source of information proactively; not just to educate consumers and the media or as an effort to react to a crisis situation. It’s not just about pushing out releases to the press, creating innovative YouTube videos, or using various social media sites to repost your press releases. It’s about creating a dialogue, maintaining consistent messaging regardless of the source, and creating a trusted reference to help manage the misinformation and quick-time reaction generated by the increasing use of online and mobile tools. And so while we all try to keep up with the changing messengers of communication, we ultimately cannot forget the message. Seem obvious? You’d be surprised how easy it is to forget. Emi Nakatsugawa is a media consultant in Dow Jones Media Lab based in New York City. Will Toyota’s PR fiasco drive it into the slow lane? Toyota, which built its brand not around sizzle but quality and reliability, has allowed its rather ordinary recall to metastasize into a reputation-threatening crisis. Incentives seem to be putting a little more polish on the brand, but good PR is still essential for long-term performance. Unlike Johnson & Johnson’s reaction to its Tylenol-tampering scare in 1982, Toyota officials chose to ignore complaints about sudden unintended acceleration in some of its vehicles. Rather than come forward with hat in hand to offer a heartfelt mea culpa to its customers, and to outline detailed plans to remedy the problem, the carmaker responded with delays, obfuscation and buck-passing. As a result, Toyota’s fleeting opportunity to take control of the story evaporated, leaving the automaker in an untenable public relations predicament. Toyota’s inability to act quickly and implement a crises communications strategy to offset the flood of negative attention tarnishing its brand will likely be examined for years by PR wonks. The consensus view among PR and crises management professionals is that J&J’s bold handling of Tylenol’s safety scare was key to its success. In fact, within weeks J&J developed tamper-resistant packaging, which, in the end, served to heighten the value of the Tylenol brand by making product safety one of its hallmarks. What’s more, while J&J’s share price and market share plunged on the news, the pharmaceutical concern’s stock was 10% higher a month later due in part to J&J’s prompt response – something consumers and investors alike were willing to reward. By contrast, following Toyota’s safety scare, its top brass are now facing a blistering inquiry by congressional members eager to parade their pro-American bona fides — or alternatively, score political points by soothing Detroit’s smarting ego. Long sensitive to the potential for backlash for becoming the market leader in worldwide sales, Toyota may also have to manage pent-up resentment in the U.S. generated by its displacement of General Motors from its leadership status at a time when U.S. manufacturing jobs are flagging. And in its all-out push to become the world’s top carmaker, Toyota admittedly strayed from its core value of focusing on the customer and quality. Making matters worse, competitors, including Ford and GM, are now angling to exploit Toyota’s Achilles’ heel to poach customers by playing up their own vehicle safety records and promoting strides in dependability. Indeed, Toyota’s recall will test its legions of loyal customers. But can Toyota still win the PR war and recover from the worst crisis in its storied history? In short, yes! Toyota’s slow response to its sticking accelerators manifested the gulf between Western and Japanese corporate cultures (Toyota’s glacial decision-making process is legendary). No doubt, Toyota will apply the same rigor to resolving its safety issues that has made its widely emulated lean manufacturing philosophy and production line efficiencies the envy of world. The venerable Japanese company will need to effectively communicate these re-focused plans to the media … quickly. Toyota can fine tune its communications strategy by evaluating their coverage and understanding who their key influencers are and what they’re saying. Check back next week for a look at how Toyota’s recall played out in traditional and social media. Brian Panton is a quality assurance specialist and report writer in Washington, DC. For years, invariably, some presentation at a reputation conference would include a quote from Warren Buffett: “It takes 20 years to build a reputation and five minutes to ruin it.” I began to think that the next time I saw a Warren Buffett quote in a PowerPoint, I would fake a seizure to get out of sitting through the surely tired, overplayed content. This got me thinking about my clients over the years, and how relevant this lesson is for organizations trying to structure programs to monitor and measure “the information superhighway.” Below is a lifecycle framework to illustrate the value of expertise for both nascent and mature brands looking to capture the effects of their PR and social media efforts. As more is said about you online, the benefit you get from analysis grows. So what does this mean for brands and agencies trying to measure the impact of news and social media commentary? If you’re just starting out, there are a lot of inexpensive and even free tools you can use to start to analyze and interpret information yourself. If your campaign generated as few as 50 mentions, it may not be worth it to invest in outside counsel. But as your brand presence increases, your need to bring in experience and expertise grows exponentially. In economic terms, we’re talking about “increasing marginal returns” – basically, the value you receive from analysis is greater for the next article than it was for the last. 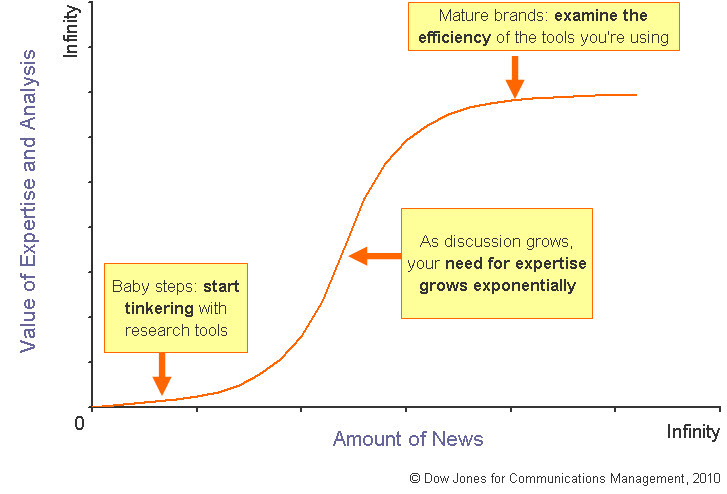 It soon becomes vital to have a team – either third-party, in-house, or both – that focuses on absorbing, interpreting, and reporting on performance in the news and online. Our most satisfied and engaged clients of PR measurement services from Dow Jones practice this in one of two ways: by designating a “power user” internally to deliver information to the field teams and managers that need it, or by utilizing our team of consultants to regularly deliver reports and analysis that distill news and data into usable intelligence. For mature brands, the value gained from expertise is high, but the returns start to level off. You need to start asking questions about the efficiency of your investment: am I leveraging the right technology to supports the experts I’ve employed? Do I have specialized teams for analysis, or I am still expecting communicators to also be number-crunchers and analysts? Surprisingly, many large companies cannot state the number of vendors they employ to gather news and information globally; we work with these clients to eliminate redundancies in content, integrate unique feeds, and standardize results. This helps their investment in intelligence tools go further – which ultimately helps improve ROI. Jennifer Hoffmann is Manager of Media Consulting at Dow Jones and is based in New York City.